As Chapter One opens, Oz Keiller laments the blaring six o’clock Saturday morning alarm clock. By page four he’s grumbling about having to spend the day cleaning the kitchen in his family’s restaurant. On page five Oz complains to readers about his bossy older brother, Dave. Page six brings a broken light bulb outside Chez Isabelle’s door - more mess to clean up. At this point readers might be thinking of dropping Cold Case back in the book return. But when the blood appears on the prep table at the top of page seven, readers will find good reason to continue. And if that’s not enough to hook them, the dead body in the freezer on page eight will have them moving quickly to Chapter Two. Mom is out of town. In Paris. She won’t be back anytime soon. A suspicious relative. Why wasn't Dave’s car home when Oz woke up Saturday morning, and why did the dead man have a note that read “D. Keiller Fri night-midnight. Use back door.”? Shifty employees. One guy “disappears” for a while. Another is named Razor. You know that’s suspicious. An interesting back story. Oz’s father died of a heart attack before Oz was born, but Oz learns that his father was caught stealing nuclear secrets from Los Alamos National Laboratory. Present day connections to the interesting back story. The dead guy? He’s the journalist who broke the story on Oz’s dad. A good friend. Rusty is Oz’s combat boot-wearing friend, and she has agreed to help solve the murder. Oh yeah, and there’s a politician involved. Nothin’ more suspicious than a politician in a murder mystery. So basically everyone is a suspect and the closer Oz gets to the truth, the more suspicious everyone seems and the more danger he is in. 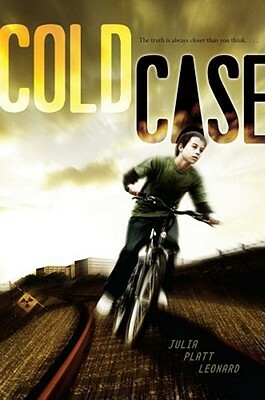 Some readers with more distinguished tastes (read: grown-ups) might complain that Cold Case is a formulaic and predictable mystery. Maybe. But the young readers who double as literary connoisseurs are few and far between. Most young readers just want a good book. And Cold Case will give them just that. Bedtime comes before prime time TV games end, and as I type this morning my son is still asleep. He doesn't know yet that the answer to the question at the end of this article - despite our prayer for the affirmative - is most certainly negative. For this season anyway. My deadline for this article was last Tuesday. Our Milwaukee Brewers were tied 1-1 with the Cardinals in the NLCS, and despite a Game 2 loss, we all were confident the Brewers' season would be extended. At the very least there would be a Game 7 tonight, giving the article a feel of hopeful anticipation. I really didn't think the season would be over. Nevertheless, thanks for reading. Here is the article on the newspaper's website. It’s a proverbial butterfly flapping its wings question. What happened on that April day in 2009 that led our family to Milwaukee for back-to-back Brewers’ postseason victories in 2011? What if our bus to Milwaukee that day had been delayed? What if the grill had taken two matches instead of one? What if some tailgater had wanted another bratwurst? What if...? Over the past two years, that random meeting and simple question has led our family to numerous Brewers’ games right back in the front row of the right field bleachers. And that one question has led to more questions, all of which have given our family amazing experiences and a wealth of new knowledge. For example, my son chose to wear a hat that he felt was unquestionably awesome. My daughter, however, felt that the hat was unarguably hideous. This hat, a mid-eighties gem from the days of Harvey’s Wallbangers, was formally worn by me and recently found stored safely away at Grandma’s house. This led to a question: Is this hat awesome or hideous? We asked the people walking into the ballpark. My son learned that a question is sometimes all that’s needed. See, when you’re a nine-year-old Wisconsin boy, and the people parked next to you have a genuine championship belt on display, you want to wear that belt. That twenty pounds of sparkling metal and black leather blessed my son with valuable lifelong knowledge. 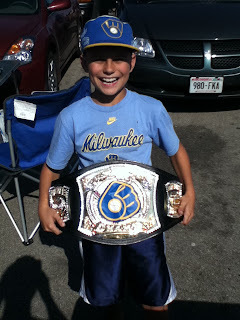 He now knows that if a man wants to wear a championship belt, he’s got three choices: A. Win a cage match. B. Win a Super Bowl. C. Ask nicely and say please. My wife, planner extraordinaire, takes great pride in her organizational skills. But even the best tailgating list-makers can misplace the paper plates. The solution was simple. Ask. “Excuse me, would you have any extra plates?” When enjoying a grilled meal with 45,000 of your closest friends, neighbors are more than willing to share plates. Of course, similar questions occasionally came our direction. People around us have asked for buns, matches, and even charcoal. Makes paper plates seem insignificant. And now, with games to be played after the author’s deadline but before the article’s publication, one question (and one prayer for the affirmative) remains: Will our family’s adventures continue to more Brewers’ postseason games? Update: For the record, we had tickets to Game 6 of the World Series.